A Yarn is usually of substantial length & of small cross section. 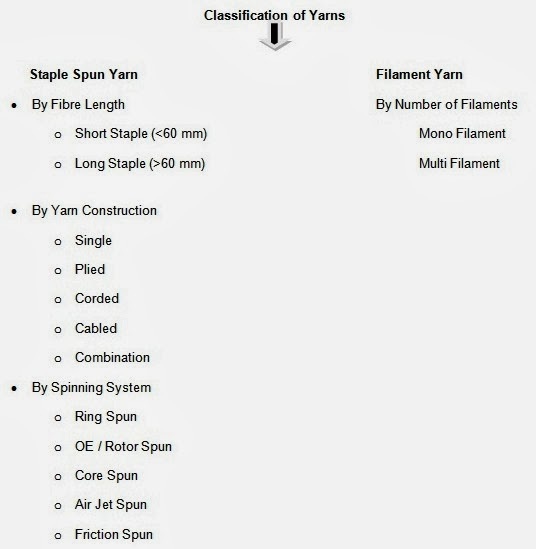 In the cross section of a yarn there are usually a multiple number of Staple fibers (short fibers) or Filaments (long fibers) of unlimited length. Yarn made out of Staple fiber is known as Spun Yarn, because the staple fibers should undergo number of process stages so that a yarn can be made out of them. This procedure or process stages in correct sequence is called “Spinning”. Fiber extrusion or conversion of filaments from Polymers was also considered as “Spinning”. Below mentioned is an introduction to the Yarns. Those are made by Twisting Staple Fibres together into a Strand. The length of the Fibre is limited. Given are some of the spun yarns. Solid, Single Strand of Unlimited Length. Many continuous filaments with some twist. Many short fibers twisted together tightly. Two single yarn twisted together. Many plied yarns twisted into a course structure. In this system, count refers to the number of hank (01 hank equals to 840 yards) in one pound. This system called as English system as well. Here it is The number of unit length of 1000 m is 1 kilogram. In here we have discussed the process of cotton yarn manufacturing. The Initial stage of the Spinning Process involves converting Cotton in Bales into the Cone Winding. 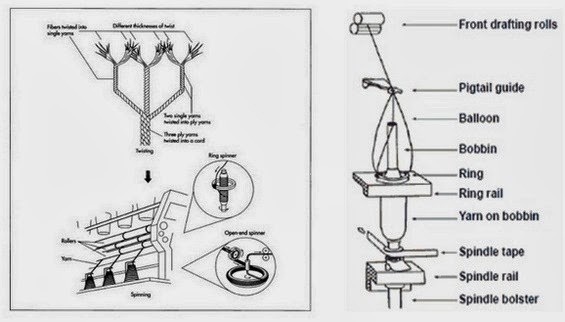 Below mentioned is how the Man-made Fibers manufacturing Process. First thing in Spinning Process is converting highly compressed Cotton in Bales into the form of thoroughly loosened, opened & cleaned State. 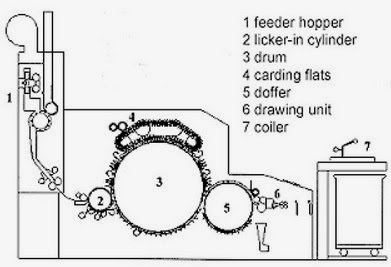 These Steps of processing are carried out in the Blow Room of a Spinning Mill. First stage of Spinning involves converting lightly compressed Cotton bales into the form of Opened & Cleaned Fibre Flocks. The spikes of the evener roller lattice, pick up matted lumps of cotton & take them to the top of the lattice. At this point, they are met by series of spikes of the evener roller. Evener roller rotates in the clockwise direction so that spikes on it oppose any further passage of cotton. Here striking of cotton by spikes of the evener roller takes place, while being held by spikes of evener Lattice. Thereby a rough combing action also takes place. The spiked Lattice takes part of the cotton with it, while evener roller knocks the remained back, into the hopper. Hopper is a box like room in which the evener lattice is mounted. By this action, the size of the matted cotton lumps is reduced & only a portion on spikes is allowed to go forward. Fiber hanging one roller & lattice spikes are pulled in opposing directions & this pulling. The fan, which is situated at A would blow air through the duct B. 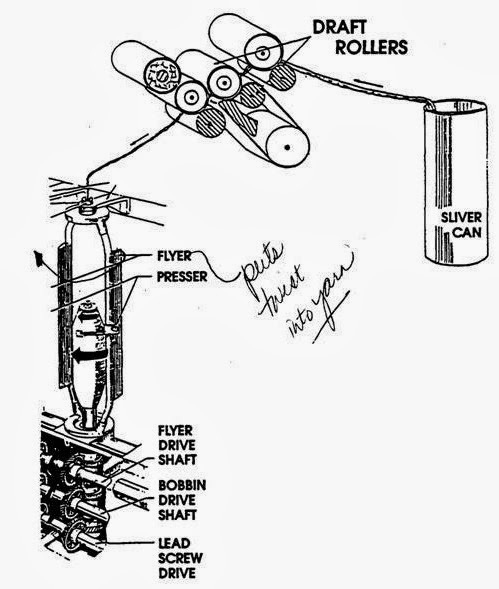 This would tend to create a vaccum in the trunk C. Air can enter the system only at position D. A low pressure near vaccum is created inside C. This would result in air rushing through D due to atmospheric being higher than that inside the trunck C. The shirley wheel consists of a section of ducting by the insertion of a rotating perforated disc. This disc or wheel rotates at about 70 rpm. This is used to separate cotton, On reaching the Shirley wheel, the air is able to pass through the perforations in the wheel causes the cotton is arrested & dropped into the space below. 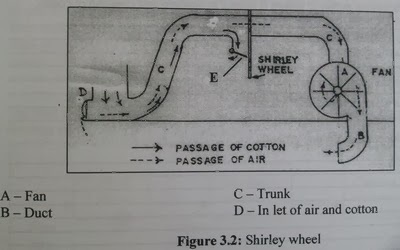 The rotation of the wheel causes the cotton to be carried downwards through a lightly spring loaded control flap E. Cotton falls freely under gravity. The fine dust passes with the air through the perforations of the wheel. This is then discharged with air to the dust settling chamber or dust filtration system. This is the action that is mostly responsible for removing impurities of Cotton in the Blow Room. 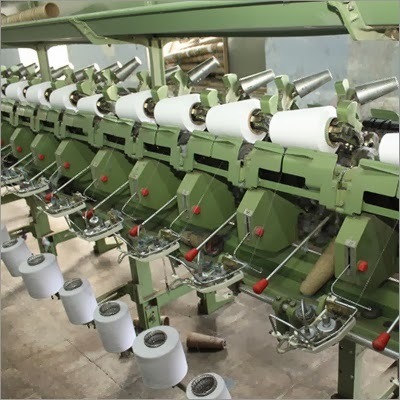 Cotton fibres can be subjected to the striking action of Beaters in the following ways. Striking the Cotton while being carried by Air Currents. Striking the Cotton while being held by a pair of feed rollers or paddles & pedal rollers. Opening the tufts into individual Fibres. Eliminating all the impurities contained in the Fibre that were not eliminated in the previous cleaning operations. Selecting the Fibres on the basis of length, removing the shortest ones. Parallelizing and stretching of the Fibre. Transformation of the lap into a sliver, therefore into a regular mass of untwisted Fibre. When two close surfaces have opposite wire direction and their speed direction or relative motion is also opposite. Then the action between two surfaces is called carding action. It is occurred between flats and cylinder. Maximum individualization of fibers is achieved in this region. Naps short fibers dirt and dust are removed by this action. There always should be point against point action. When two close surfaces have same wire direction and their speed direction or relative motion is opposite then the action between two surfaces is called stripping action. It is occurred between licker in and cylinder. There are should be point against back action. Individualization of Fibre is also by this action. This is the machine on which drafting & doubling are carried out. Carded sliver is that they are not even (uniform) enough to produce to good quality yarns. Therefore, usually all the carded slivers are subjected to Doubling & Drafting on a machine called “Draw Frame”. Doubling is the practice of feeding two or more strands to produce one Strand. To attenuate fiber laps to slivers, Drafting is carried out. Different methods are used to draft sliver or yarn. One method is called “Roller Drafting”. During drafting the number of fibers in the cross section of the sliver or lap is reduce. Equalizing: One of the main tasks of draw frame is improving evenness over short, medium and especially long terms. Carded slivers are fed to the draw frame have degree on unevenness that cannot be tolerated in practice and slivers from the comber contain the “infamous” piecing. It is obscured by draw frame. Equalizing is always performed by a first process, namely doubling and can optionally also be performed by a second process, namely auto leveling. The draft and the doubling have the same value and lie in the range of 6 to 8. Parallelizing: To obtain an optional value for strength in the yarn characteristics, the fibers must be arranged parallel in the fiber strand. 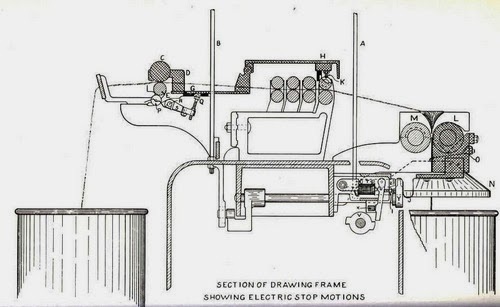 The draw frame has the tasks of creating this parallel arrangement. It fulfills the task by way of the draft, since every drafting step leads to straightening the fibers. Blending: In addition to the equalizing effect, doubling also provides a degree of compensation of raw material variation by blending. Their results are exploited in particular way in the production of blended yarns comprising cotton or synthetic blends. At the draw frame metering of the individual components can be carried out very simply be selection of the number of slivers entering the machines. The product delivered by roving machines is called Roving. Roving is a Fibre strand of lesser count than that of a sliver. It is also has a small twist to keep Fibres together. It is wound on to a package which is suitable for feeding spinning machines. Attenuation of draw sliver to a suitable size for spinning. To insert a small amount of twist to strengthen the roving. To wind the twisted strand roving into a bobbin. To reduce the weight /unit length of sliver to make it suitable for ring spinning system. To insert small amount of twist to give required strength of roving. To wind the twisted roving on to bobbin. Combing is a process which is introduced into the spinning of finer and high quality yarns from cotton. The carded materials (sliver) contain certain amount of short fibres, neps, fine kitty and leaf particles. Short fibres are a hindrance to spinning of finer counts where the number of fibre in the cross section of the yarn is less. The short fibres cause thick and uneven places in the yarn length and the yarn looks hairy. Apart from this, very short fibres do not contribute anything to yarn strength. Short fibres below a certain pre-determined length can be easily separated out by using comber. To remove the short fibres below a pre-selected length so that the spinner enable to produce finer or better quality of yarn that cannot be possible in carding state. Elimination of large proportion (not all) of the neps in the fibre. Formation of sliver having maximum possible evenness. One article has written about basic principle of a comber. So here only title of comber principle is given below. The ring spinning machine was first invented in 1828 by the American Thorp. In 1830, another American scientist, Jenk, contributed the traveler rotating on the ring. There have been many development has done in ring spinning machine for the last years but the basic concept remained unchanged. Winding the twisted yarn on to the bobbin for suitable storage, transportation and further processing. It delivers a yarn with optimum characteristics. In ring spinning machine twisting and winding are done simultaneously. That’s why the power consumption is higher. This is the final stage in Spinning & that is Cone Winding. As nowadays good winding is the mirror of spinning mills, it is necessary that this process is understood very well by all the personnel handling the department. Yarn winding can thus be viewed as simply being a packaging process, forming a link between the last few elements of yarn manufacturing and the first element of fabric manufacturing process. Improper utilisation of the features of the winding machine can not only cost heavily to the spinning mills, but it can also lead to loss of good customers permanently.